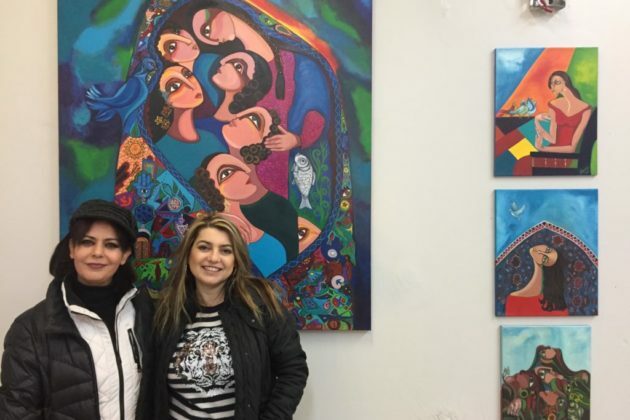 Maysoon Al Gbari (left) and Nawara Omary Elliott (right), with some of Maysoon’s paintings. Idylwood Plaza is home to to a new international gallery. The pop-up Dara Global Arts offers paintings, furniture, ceramics, and gifts at a wide range of price points, and is a gallery driven by social consciousness with particular attention to women’s empowerment. Many of the artists represented are Iraqi: while most Americans only see Iraq as a battleground on the news, Dara Global Arts provides an opportunity to see firsthand the country’s importance as a source of contemporary art. On a recent visit by Tysons Reporter to the gallery, the directors, Nawara Omary Elliott and Maysoon Al Gbari, were busy setting up. 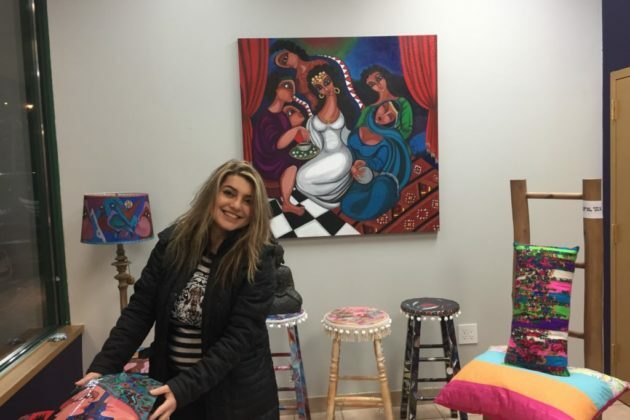 Over the smell of slow-burning incense, freely mixing Arabic and English, the pair revealed more about the gallery, the artists and the challenges and opportunities of opening a pop-up in Tysons. Omary Elliott has been running Dara out of her basement for years, hosting exhibitions that often filled the space to its capacity. She is motivated by her belief that “art is a peaceful language that can bring awareness” and her dedication to social justice. That dedication to justice has driven her to collaborate many times with a variety of charities, including Bringing Resources to Aid Womens Shelters, the Iraqi Childrens’ Foundation, and the Downs Syndrome Association of Northern Virginia. Al Gbari is a professional artist who, upon arriving to the United States, faced a problem shared by many international artists: a lack of opportunities for gallery representation. Many artists come to this country but, lacking a community and behind a language barrier, struggle to make a living selling their work. Al Gbari and Omary Elliott both grew up in the secular, intellectual, artistic climate of pre-war Iraq and the pair met in Virginia in 2016. They became fast friends, and Omary Elliott’s work as a gallerist blossomed. After a year and a half searching for a suitable space, they are excited to announce the opening of Dara’s first storefront location. The idea for a pop-up came from Omary Elliott’s frequent visits to New York City, where the practice is popular among gallery directors. When she first brought the idea back to Tysons, it was hard to find support, and property owners often weren’t even familiar with the concept. Over the past 18 months alone, though, she’s witnessed substantial change. “As Tysons is growing, I noticed that the pop-up term has become more popular,” she said. Even so, it took patience and a very helpful realtor to find a suitable location. Omary Elliott encourages others to consider a similar approach, but cautions them that they’ll need a lot of patience and flexibility. The Washington Post has previously suggested that pop-up retail could be catalytic for Tysons’ development. The gallery showcases work by a half-dozen artists, about half of them Iraqi. Omary Elliott didn’t set out to represent Iraqis specifically; in fact, she is constantly searching for new artists to represent, saying “we don’t close the door to anyone who wants to participate.” Rather, the strong showing of Iraqi artists is testament to Iraq’s millenia-long tradition of visual art and Baghdad’s stature before the 2003 invasion as home to the greatest artistic institutions of the Arab world. Al Gbari’s own art fills much of the exhibition space. Working in several media and several artistic styles, she seems to give us several artists’ worth of paintings and household objects. Al Gbari’s art blends figuration, often of women and cities, with a rich symbolic language and bold expanses of color. 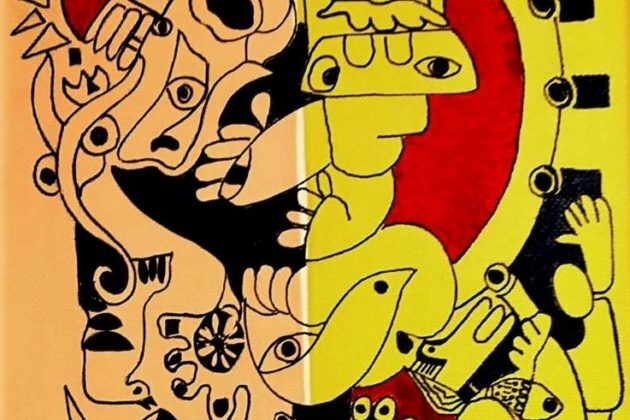 Some paintings draw deeply upon Arab legends and Judeo-Christian-Islamic religious traditions, connecting them to modern-day social issues. Others literally pop into the third dimension as the shapes of faces jut from the canvas. Yet more speak through simple figures to universal themes of motherhood, love and loss. That classic relates the stories of a woman, Shahrazad, who must spin a new tale every night to avoid the wrath of a vengeful king. She is a symbol of self-expression, literary beauty and cunning femininity. 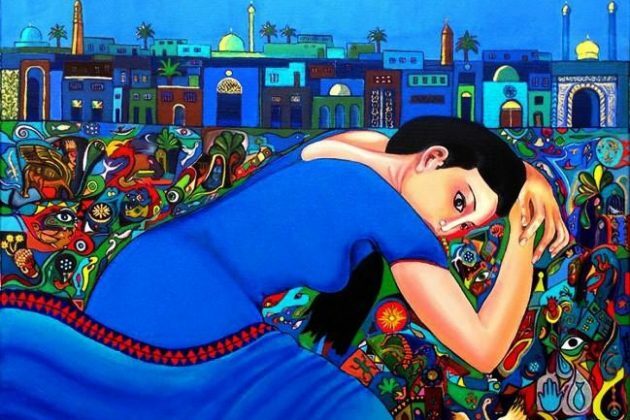 In Al Gbari’s painting, Shahrazad lies fallen against a field of symbols rich with meaning, struck against the skyline of medieval Baghdad with its churches and mosques — a scene which, Al Gbari tells me, truly was as colorful as it appears. But here, Shahrazad has fallen silent, mourning a city wounded by 21st-century bombs. Oliver De La Via is a young Bolivian-American artist whose most recent series, “Numbed Contours,” deals specifically with sexual assault and sexualization on American college campuses. His works are unrestrained, honest and, at times, startlingly ambiguous. 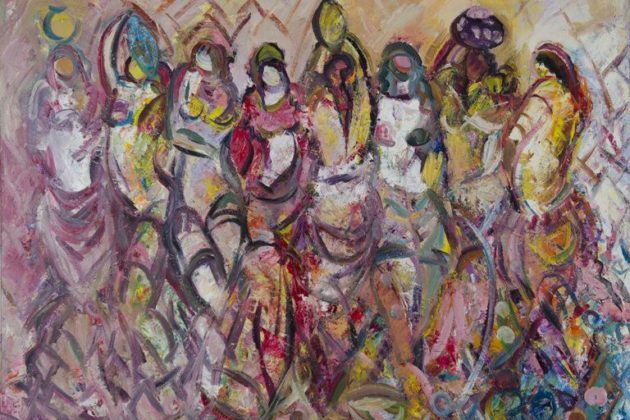 Baha Omary Kikhia has exhibited her work, which is “based upon her concept of the woman as a powerful and inspiring figure,” internationally. Her abstracted, curved figures are highly emotive. They call upon her personal experiences, like her struggle to raise two children as a single mother in 1970s New York City, and international issues, like ISIS’s destruction of precious cultural heritage in her home country of Syria. Other artists featured in the gallery include Ahmed Ghareeb, a sculptor and painter with a bright, chaotic, abstract style that tends toward expressionism, and Haydar al-Yasiry. The gallery carries a variety of decorative arts in addition to paintings. The collection includes lamps, wooden boxes, chairs, and large and small tables, as well as a variety of gift-appropriate objects at all price points. The Dubai-based brand Mishmashi makes an appearance with lively, one-of-a-kind cushions from their Flip collection. Al Gbari, a Muslim, hand-paints Christmas ornaments, echoing the secular Iraq of her childhood. Dara Global Arts accepts commission orders to custom-decorate furniture or to paint a canvas at a specific size and using a specific color palette to match any room. Committed to social good, they are also eager to work with charities of all kinds, and will happily host private charity events and offer 20 percent of proceeds from art sold directly to the charity. Dara will also host a series of special events, like a solo exhibition reception on Feb. 5. and a Valentine’s Day event on Feb. 15. Dara Global Arts will be open at in Idylwood Plaza next to the Starbucks 7501 Leesburg Pike, Falls Church, until the end of March and possibly beyond. Hours from 10am-7pm daily. Contact 702-582-0804 or [email protected] with inquiries, or see the online store at daraglobalarts.com. D. Taylor Reich is a freelance journalist who writes about urbanism and development. They are a Fulbright scholar, a 2017 graduate of Brown University and a proud alum of Arlington Public Schools.